Now I know that you are all thinking that it is a little late to wish you all Happy Christmas and yes you are right it is!!!! Don't you agree that these cold viruses seem to be getting stronger every year??? I think I had been buliding up to it over the last month and it just hit me all at once, I can here you all saying we told you so, slow down!!! I promise to listen to you all in 2013 as I hope for a more easier and healthier year. Anyway me, being me and not being able to sit here and do nothing, I have been playing around with the website today and have managed to put on the Beadtime Steampunk Charms . This is something that I have wanted to do for a while but needed the time to do so. I absolutely love using these charms as they are so detailed and are very good quality and really add a touch of class to a project. A lot of my ladies have requested that they would love to make one of the boxes next year at my workshops so I will be running a class to do this. 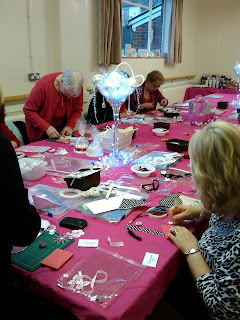 All of 2013 workshop dates will be posted on the blog and website very soon, as soon as I get confirmation back from the hall. Well I wish you all a Happy New Year and hope that 2013 will be a healthy one for us all! Happy Christmas Eve, blog visitors, Kirsten here, I've scheduled this post to appear in the evening. I'm taking some time off over the Christmas, but I'll be back with a new challenge on January 1st, sooner if I get time to work on some new projects. In the meantime, here are some more of Lisa's samples for J & C Creations. Thank you for supporting the blog, by visiting it & entering the challenges. There's still time to enter this month's, all the details are HERE. Have a very happy Christmas. Until next time, take care & happy crafting. It has been a hectic week in both mine & Lisa's households. I saw her for about five minutes on Wednesday to give her her Christmas card & to toss around a few ideas for the January challenge. I have ventured into the disaster zone that is my craft room, but haven't been able to come up with a single idea. My intention is to give it a thorough tidy after Christmas & hopefully I'll get some inspiration, once I can see what I've got. Thankfully, I remembered that I hadn't shown you all of the samples Lisa made for J & C Creations while they were at the NEC in Birmingham in November, so three of them are illustrating today's post. No photograph can do justice to these cards. The sparkle on them is wonderful. When I first saw them I assumed Lisa had used a black glitter, but it's black ink with a WOW clear sparkle embossing powder on top. Lisa will be stocking lots of new WOW EPs from January, so if you haven't tried them yet & you want to treat yourself to new stash, keep an eye on the website & here. We'll let you know as soon as they arrive. That's it for today, sorry to be so brief, but there's still lots to do. Have a great weekend - anyone watching the Strictly Come Dancing final tomorrow night? Dani or Kimberley to win! Morning all, I've been up since five & I am determined to get this post written & published in the next twenty minutes. It has been a hectic week, I am still way behind on my Christmas projects & I haven't posted anything on my own crafting blog in THREE weeks!! I don't have anything new to show you, but I wanted to share these easel cards that I made using two of the Hobby House Christmas toppers. Like the fairies & the elves, these images are very sweet & so detailed that you can make a simple, but very effective, card quite quickly. The toppers are die cut already, so I just matted & layered them onto red & green core'dinations & gold mirri card. It's not showing in the photo, but I added a subtle shimmer to the highlights in her hair with a glitter pen, it looks lovely when light hits it. When I'd put everything together, something seemed to be missing & I couldn't decide what it was for ages. Then I had the idea of doodling around the edge & surprisingly, it worked. Who could resist that cute face??? Okay, that's it for now, I have so much to do today. Don't forget the blog challenge!!! We've had some more entries, so have a look at them & then enter your projects, there's still plenty of time. Thanks for visiting today, until next time; take care & happy crafting. Now I know I have been a really bad blogger lately but work commitments have kept me away a lot this year at Shows and Kirsten has been making a fantastic job of keeping you up to date with all things at Lisa.B.Designs HQ lol! At last I have a few weeks of well earned rest so I am hoping to get the website updated with lots of new products and update the blog and Facebook more over the next few weeks along with Kirsten. As soon as I have finalised the new workshop dates for next year they will go on the website and blog too. The first one which is 1st February is already fully booked on the early class and the second is booking very quickly with only a few places left. Well firstly I would like to say a huge thank you to all the ladies that attending my Christmas Party end of year Class at Fant Hall and as you have seen Kirsten brought you some great pics of the day. Can I also say a huge thank you to Kirsten, Rosemary, Kate, Jan and Suzanne who without your help I could not cope with it all each month, you are all gems and I appreciate all that you do. A big thanks to my lovely friend Kathy Mills from the Glitter Girls that travelled down all the way from Birmingham with her friend Sue to attend the class, it was lovely seeing you both. Well that's all from me for now. I wish you all a Happy Christmas and look forward to seeing a lot of you in the New Year. Hello blog visitors, Kirsten here, I hope you're enjoying your Saturday. Tonight's post is all about yesterday's Christmas party classes & there are lots of photos, hope you enjoy. This is one of the four decorations that decorated the tables, they were made by Lisa's friend, and class member Rosemary. They were gorgeous & looked wonderful against the pink tablecloths. Many ladies in the afternoon class arrived extra early to snap up some bargains from the sale section & to grab the newly arrived goodies. There were these packs of gorgeous die cut flowers from Craftwork Cards. The wreath was made with the flowers from the black/grey/cream pack, using the chipboard circles underneath. Other lovely items from CWC were die cut birds & birdcages. Next we had a selection of new embossing folders from Crafts Too. Many of the new products actually sold out yesterday but Lisa have the remainder on the website very soon. We had a celebrity join us for the afternoon class & the plan was to ask her to have her photo taken with Lisa but of course we were so busy that we completely forgot. It wasn't until I uploaded these pics that I realised she was in the background of this one. It's Kathy Mills of The Glitter Girls, of course. It was lovely to meet Kathy & her friend, Sue. I think they enjoyed their afternoon with us. 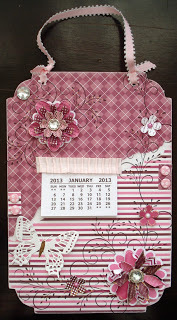 The first project was this lovely calendar. The flowers are from the CWC packs above. There was also a calendar in pink tones which I don't seem to have a photo of, so if anyone who chose the pink yesterday is reading this, perhaps you'd send me a photo & I'll add it to this post, with a credit to you. Thanks. Georgina Sweetenham, who attended the evening class, has kindly given me permission to share her photo of her calendar here. She also took photos as she went along, so visit her blog at http://kaardvark.blogspot.co.uk/2012/12/calendar.html & you'll see the various stages. Here are a few ladies from the afternoon class working away on their calendars. After a delicious cold buffet, work began on the second project, a lovely little gift box. Each pack was a different colour, so everyone got to choose the one they liked best. After a quick break to tidy up & replenish the buffet table, it was time to welcome the ladies for the evening class. During both classes we had raffles & quizzes & many ladies went home with a prize. Everyone who attends Lisa's classes during the year is given a raffle ticket & a single ticket is picked at the Christmas party to win a hamper containing over £100 of crafting goodies. Another photo of one of Rosemary's table decorations, taken this time during the evening. It gives you a better idea of the lights & the sparkle. That's it, I hope you've enjoyed this selection of photos & if they've tempted you to join us next year, contact Lisa to go on the waiting list. There's no class in January, so the first class of 2013 will be on February 1st & the afternoon class is full already, so don't delay there is still a few places left on the evening class. I'm going to post a full list of 2013's class dates as soon as Lisa has confirmed them, here & on Facebook. 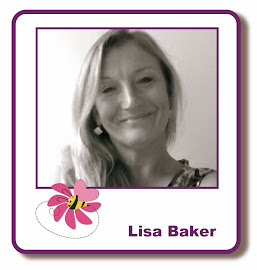 On Lisa's behalf, thank you to everyone who attended her classes in 2012, she's looking forward to seeing you all again next year. I shall be back with another blog post in a day or two. Enjoy the rest of your weekend. Take care & happy crafting. Happy Wednesday, blog visitors, hope you're managing to stay warm. We had some snow early this morning, but it didn't last, thank goodness. I hope you saw yesterday's newsletter, if you didn't, it's HERE. The final class of the year is in Maidstone on Friday, the mobile craft shop will be there, open from 2.30 to 9.30pm & there is a big SALE on many items, Christmas & non-Christmas. So, if you're in the area, feel free to drop in & pick up a bargain or two. One of the Friday's class projects will be a calendar & I had a play with one, so that I could show it here. The shaped base is chipboard, which makes it very sturdy. I started by building up layers of Rangers' Aqua & Willow paint dabbers with a piece of cut & dry foam. The paint dries quickly, but you can speed up the process with a heat tool. I stamped some flowers & splatters around the border with blue dye ink. The next step was to colour a piece of white cardstock with Antique Linen & Old Paper distress inks, followed by stamping lots of Kanban stamps with Old Paper & Faded Jeans, making sure to dry each layer thoroughly. distressed the edges before adding Brushed Corduroy DI. I coloured a piece of white lace with Old Paper & Antique Linen DIs & pleated it around the label. The calendar fits on the largest of these Spellbinders' labels, so I used the same die as a template, drew around it & cut it out. The butterfly was stamped with a chocolate brown ink, covered with clear embossing powder & heat set. The sentiment is a Tim Holtz stamp from my stamp. After I put everything together& added the pearls, I decided the base needed something else, so I scribbled in places with a Versamark pen & added copper embossing powder. Thanks for visiting the blog today, I'll be back soon. Until next time, take care & happy crafting.